Located at Beale and Second Streets, the Memphis Music Hall of Fame is as outrageous as our inductees. This amazing museum Chronicles the artists and the music that shaped the legacy of Memphis Sound. 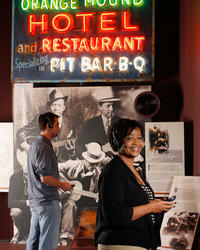 This museum features the Smithsonian's Rock 'n' Roll, Social Crossroads exhibition. Step back in time and explore the oldies but goodies! Visit the original site of the Stax Records studio in Memphis, Tennessee, the Stax Museum. See this museum's special tribute to the artists who recorded there, as well as other American soul legends. Discover the museum's rare and amazing collection of more than 2,000 artifacts, interactive exhibits, films, and galleries. On the Memphis African American Heritage Tour,'you will be picked up at your Hotel or Local Accommodations and we will take you to'visit'two historical locations in Memphis for Self-Guided Tour of the National Civil Rights Museum and the Burkle Estate "Slave Haven" 'Museum. 'The National Civil Rights Museum is the location of the Lorraine Motel where the'Dr. Martin Luther King was assassinated and the'Burkle Estate'Museum commemorates an underground railroad stop for slaves traveling north for freedom. Visitors will see and experience the refuge provided for slaves by Jacob Burkle, who was instrumental in'helping countless individuals seek freedom.